The northernmost town on Ticao Island, Masbate is Monreal, an unassuming coastal settlement with a few early 20th century colonial homes and glorious views of Mt. Mayon and Mt. Bulusan on the Bicol Peninsula at the pier across Ticao Pass. Monreal also serves as a staging point for island-hopping adventures around the northern islets, sandy beaches, rock formations and one of the most amazing waterfalls I’ve ever seen! Passing by some rocky islands with impressive escarpments and shallow caves, we arrived at Halea Nature Park on San Miguel Island, which harbors small beach coves where, according to our guide, harmless juvenile sharks use as shelter. A resort, lighthouse and a few beach huts are the only manmade structures of the island. Travelers can comfortably spend the night here, or camp on the beach. We donned our snorkeling gear to admire the coral reef off the main beach. The welcoming party were mostly damselfish and anemone fish. The sharks were (thankfully?) a no-show that day! Go-island hopping in Monreal, Masbate to discover its secrets – like San Miguel Island. Snorkeling at Halea Nature Park. No sharks spotted, though. Our second stop: the beautiful rocky islet of Borobangcaso. The second stop was Borobangcaso Islet, a rocky island with a pretty stretch of white coralline sand that’s punctuated by an imposing rock formation that looks like a stack of books. Rounding off the northern end of Ticao Island, we entered Masbate Pass next to Guinlatayan Rock Formation, a large pinnacle leaning against a rock island that’s also a refuge for sea birds. The most incredible site on this trip however was definitely the last. Rising over 100 ft in height is Catandayagan Falls, a stunning single-tiered cascade that’s politically part of San Jacinto town. Despite its meager flow due to the summer season, this is the first waterfall I’ve seen that plummets straight down to the ocean! According to local legend, our boatman relates, Catandayagan Falls is guarded by a monstrous octopus. My friend and I jumped off the boat to snorkel for a short inspection around the base of the falls, and we were relieved to find nothing but fallen logs and debris on the murky sea floor. As the receding sun painted the skies with varying shades of purple and orange, our ride back to Monreal town afforded us a wonderful panorama of three volcanoes on the Bicol Peninsula – Mt. Mayon with its extinct sister, Mt. Malinao, in Albay, and Mt. Bulusan in Sorsogon. Catandayagan Falls drops straight to the open sea! A closer look at the 100-foot seaside waterfall. Passing by Ticao Pass with views of Bulusan volcano, on our return trip. From the Bicol Peninsula, one can get to Monreal by taking the two-hour ferry (PHP 120) from Pilar, Sorsogon. From Masbate City, you get to Ticao Island by crossing Masbate Pass to Brgy. Lagundi in Batuan, where you can visit the century-old miyapi tree at Bongsalay Mangrove Forest, then hire a motorbike to shuttle you northwards to Monreal (45 minutes, PHP 300-500). A full-day island-hopping tour costs PHP 1,500 per person for a minimum of four, inclusive of meals. Tours can be arranged through municipal tourism officer Ana Carolina del Mundo. Mobile number: +63 9109950239. It’s possible to visit these sights in northern Ticao Island from Masbate City on Masbate Island, but I assume the rates will be higher as the distance to be traveled is much farther. We stayed at homestay-like Grona Inn, which offers A/C double rooms for PHP 1,000. Cheaper but smallish fan rooms are available. Mobile number: +63 9073867405. 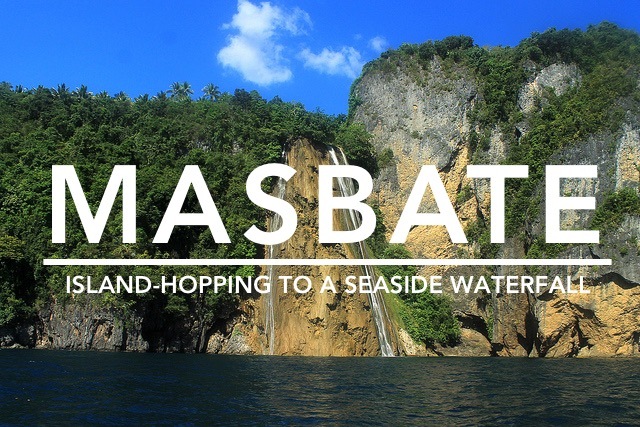 Find discounted rooms in Masbate here. thanks Ed for this wonderful post….hope to see you here again soon! Enjoy your visit to Ticao! What tips are you looking for? Naa man lagi kaw blog sa Ticao Edgar.